by declining 30�in horizontal direction. Sheet of paper licked up from drying cylinder group enters glue applicating channel made up by two applicator rolls to conduct after sizing, then entering next group of drying cylinders for drying. One of the two rolls is chromeplating roll, another is rubber roll. Chromeplating roll is fixed. 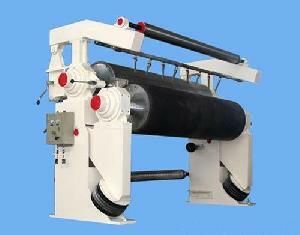 Rubber roll is pressurized upward laterally. Form of pressurization is pneumatic. Hyperbolic pneumatic tyre apparatus single point transmission and double point transmission are adopted (This glue applicator does not include transmission apparatus). Size press is an equipment supplied by complete machine. According to arranged transmission position, it can be divided into two kinds of arrangement: left-handed size press and right-handed size press. Facing paper coming out direction, the one with transmission at right side is right-handed size press. The one with transmission at left side is left-handed size press. Our factory produces the following specifications and series: φ400, φ450, φ550, φ650, φ910, φ1100etc.